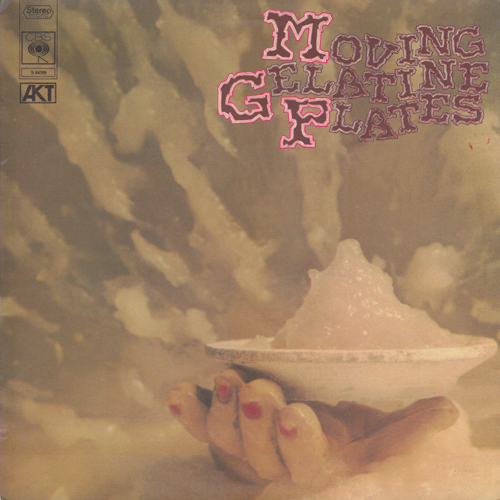 Moving Gelatine Plates is another obscure French progressive band from the early 70s given new life on CD by Musea. MGP consisted of Didier Thibault on bass and vocals (later with Gong), Gerard Bertram on guitar, Gerard Pons on drums, and Maurice Helmlinger on keyboards, sax, flute, and trumpet. This CD reissue includes their entire debut album (five songs), original cover artwork, extensive band history, lyrics (such as they are), and four bonus tracks from MGP’s 1980 album Moving. The cover art, a hand holding an exploding plate of gelatin, suggests today’s industrial bands rather than 1970 progressive music. The opening track "London Cab" has a great “industrial” intro. MGP is a refreshing glimpse into the past. These four guys really cook! Their music mixed a dash of Soft Machine, King Crimson (Lizard), and Pink Floyd (Atom Heart Mother) with a dab of Iron Butterfly (In-A-Gadda-Da-Vida drums). Fast breaks, complex rhythms, virtuoso playing, and weird lyrics combined to produce innovative music ahead of its time. The lyrics are one of the many surprises in store for you. Suddenly, in the middle of an energetic jam, you hear a processed voice reciting Three Blind Mice! Disconcerting, and in the immortal words of Mr. Spock, “Fascinating!” Don’t pass on the opportunity to buy this CD.